Breathtaking landscapes, Andean villages, Amazonian rainforest, picturesque and historic centers, and much, much more, Ecuador has an array of amazing wonders to experience. The most biodiverse country in the world, Ecuador’s Galapagos Islands, for example, are justly famed for their wildlife. For many, the association with the word Galapagos is the name “Darwin.” Charles Darwin’s visit to the Galapagos Islands had a resounding impact on the formation of his Theory of Natural Selection. When Darwin visited the islands, he noted that the unique creatures were similar from island to island, but perfectly adapted to their environments. This led him to ponder the origin of the island’s inhabitants. Years later he consolidated his observations into his famous book, On The Origin of Species, that drastically and controversially altered the scientific view on the biological origins of life. I visited Ecuador years ago. I was so impressed that I’d love to return one day. I remember visiting Mitad del Mundo (The Equator). Although the equator runs through many cities around the world, Quito (Ecuador’s capital city) has become famous for it. Mitad del Mundo consists of one large monument with smaller monuments that lead up to it, a small village constructed around the site of the equator, and a charming museum. It is truly a fascinating attraction in Ecuador to visit. Quito or San Francisco de Quito, was the world’s first city to be declared UNESCO’s World Cultural Heritage Site, along with Poland’s Krakow in 1978. A few of the main attractions of Quito are its colonial center, magnificent churches, cobblestone streets and quaint squares. Its sweeping Andean panoramas has made this highland city an attractive tourist destination. Interested in encouraging more U.S. citizens to travel to Ecuador, the Ecuadorian government recently became the first country to advertise during the Super Bowl. The ad features breathtaking views and numerous natural attractions in Ecuador while the Beatles’ song, All You Need Is Love, plays in the background. You can view the video featuring some of Ecuador’s amazing scenery at this link, All You Need is Ecuador. Ecuadorian cuisine traditionally consists of two dishes, a soup and a rice platter. Locro de papa is a classic Ecuadorian potato and cheese soup. Very popular in Ecuador, soups are served at almost every meal. As one would imagine, the ingredients and preparation can vary from one city and kitchen to the next, but locro de papa is traditionally garnished with avocados and served with aji (hot sauce). Some variations of locro de papa add fresh corn, chopped cabbage, or leafy greens to the soup. 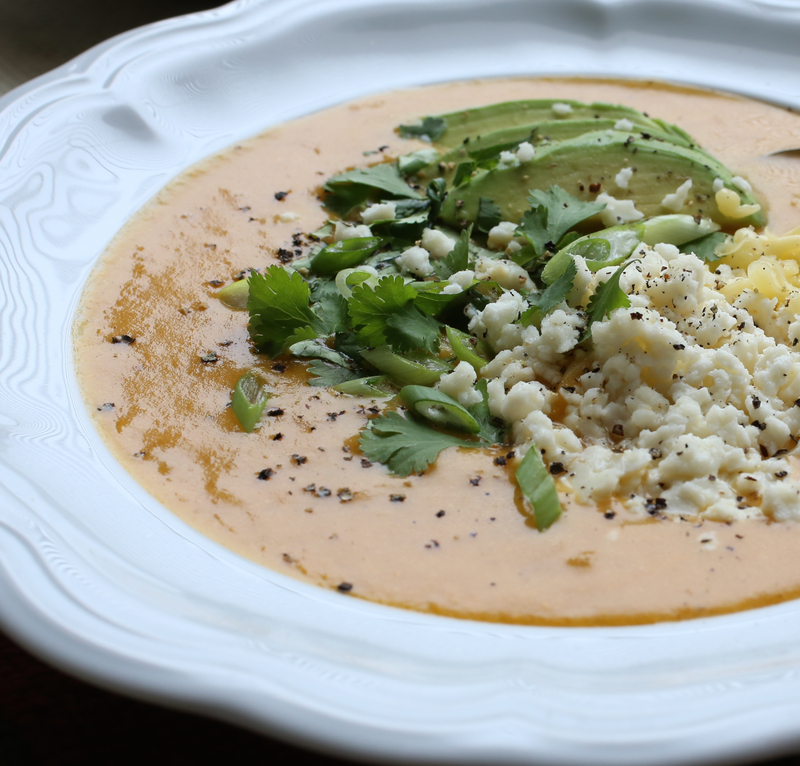 In some areas of Ecuador this potato soup is served with maiz tostado (Andean corn nuts). For my vegan friends, I understand that it’s possible to make a version of this soup without cheese. Apparently you can use ground peanuts instead. I’ll try that next time, until then, if you try it, I’d love to know what you think. Simple to make and tasty, locro de papa is comfort food to warm you on cold weather days. In a soup pot, heat oil and sauté onions, garlic, cumin and achiote powder. Cook, stirring frequently, until the onions are tender, about 5 minutes. Add the potatoes and a ½ teaspoon of salt to the pot and mix until the potatoes are coated. Continue cooking for about 5 minutes, stirring every couple of minutes. Add 4 cups water and bring to boil, then simmer until the potatoes are very tender. Use a potato masher or immersion blender to mash some of the potatoes in the pot. Don’t mash all of them, the consistency of the soup should be creamy, but with small chunks of potatoes. Add milk and let cook for about 5 more minutes. If the soup seems too thick, add more water and/or milk. Taste and add salt to taste. Add the grated cheese and cilantro (if using), mix well, and remove from heat. 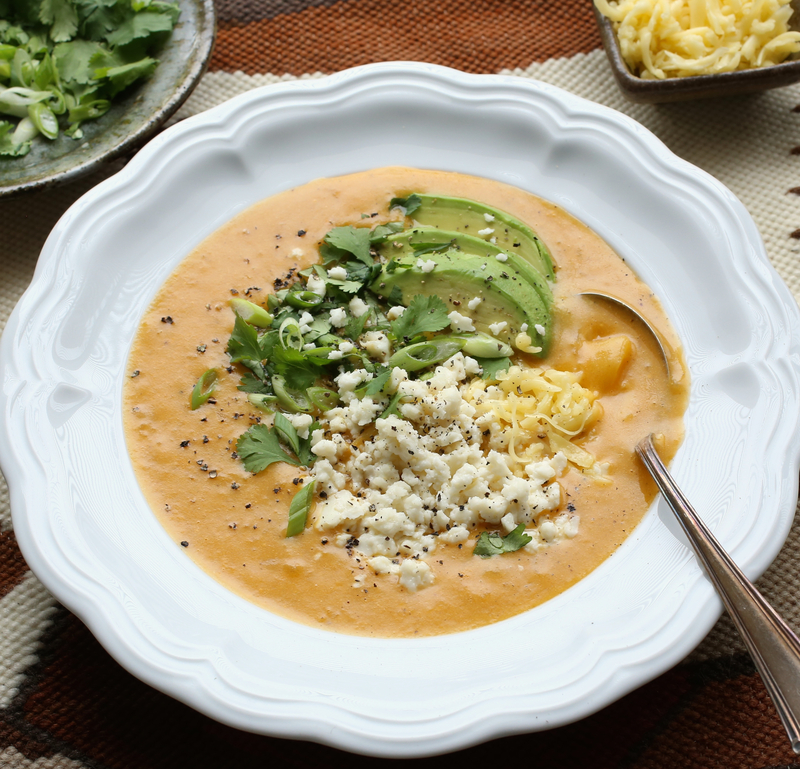 Ladle into bowls and top with avocados, scallions, cheese and hot sauce (if using). Notes: You can add chopped cilantro to the pot of soup towards the end of cooking, or simply top the soup with cilantro when ready to serve, I chose the latter. Thanks Mandy. The cold weather here has me motivated to make soups!